Wingspan, Rotorua - Mantling, rouse and broody are actually ‘expressions’, very much like our facial expressions, that raptors use to communicate. This is just one of the fascinating facts you learn on a visit to Wingspan, New Zealand’s National Birds of Prey Centre. 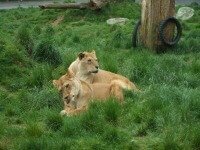 This page will be updated once the raptor centre reopens fully. Be treated to a flying display by New Zealand falcons (Kārearea) at 2pm each afternoon. I tell you what, if you question why you would visit; if you are at all interested in conservation it’s great, and then there’s also the very strange feeling of having a falcon calmly sitting on your hand or on top of your head. That's something to take home. I can see why people have been fascinated with falcons throughout the ages. Maybe it’s the thought of them being predators; cold, calculated killers and analytical to the nth degree. It’s all about them that’s for sure and they certainly don’t give a damn about us unless we are a food source. Even if born and raised in captivity, falcons will be completely wild within 5 days of being released. Sentimental? Don’t think so. 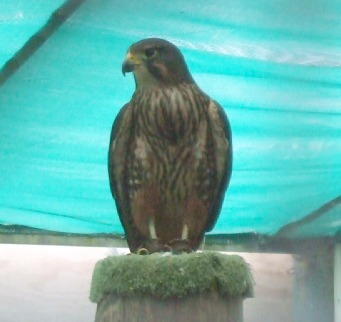 Atareta, (pictured above) is one of the NZ falcons on display at Wingspan, Rotorua. As a female she is larger than the male falcon. Something I didn't know is that falcons are rarer than kiwis with about 4,000 remaining in the wild. Once the flying display begins the fields are noticeably absent of rabbits, finches, ducks and all the other little critters that usually hang out. They know that the falcons have come out to play... yeah, right (as our famous in NZ Tui Ads would say). The falcons also control the airspace with intruders hustled quickly off the property. How rude huh? As a hunter, the falcons don’t eat road-kill. They catch their prey on the fly with steep climbs before dropping at speeds in excess of 100kph. Their eyesight is out of this world too being able to see prey up to 8 times as far as humans could. With the birds being kept in captivity they quickly forget how to hunt properly so the falconers use lures, (a bit like a fishing rod) to which meat is attached for them to hunt down. This keeps the falcons skills honed for when they are released. 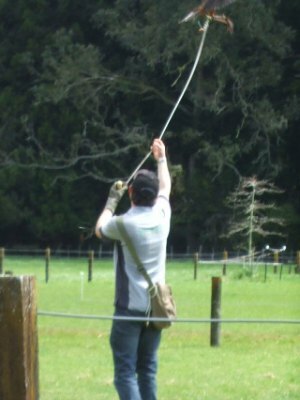 There is one trainer to one falcon and in NZ we have six trainers, five of them work here with the NZ birds of prey. 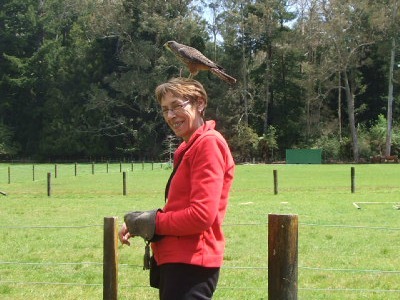 A NZ bird of prey… on my head. This is Ozzy. As the flying display continues, the trainers keep up a commentary entertaining the audience with all sorts of little stories. You can see that they are, at the same time, very aware of what the birds are doing. The falcons fly certain routes for the display and one of them is just above audience members. It can be very disconcerting as one lady found out. She got a fright each time one of the falcons flew to the perch, gliding at less than a meter above her head. The birds are housed in the aviary where they can be viewed… or not if they are incubating eggs. Along with the falcons there are also hawks and owls. Sometimes, if tucked away amidst the foliage, the birds can be quite hard to see. The museum is like a little treasure trove of bits and pieces. There are stuffed falcons that I’m presuming are old, lots of falconry paraphernalia, the talons of a haast eagle (that’s our extinct eagle that was the largest in the world), photos etc. It’s well worth a look. What do you think of our NZ$20 note? It features the falcon - NZ's official 'Bird of the Year 2012-2013'. 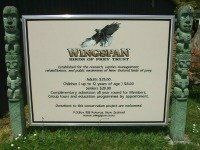 Wingspan is a charitable trust, “Established  for the research, captive management, rehabilitation, and public awareness of New Zealand birds of prey". A birds of prey conservation breeding and release programme is now Wingspan's main focus to get the numbers of these endangered birds up. Carrying out birds of prey conservation is certainly not cheap. As Wingspan doesn't receive government funding they are always grateful for any donations or sponsorship. They also couldn’t get along without the volunteers who take care of ground maintenance, cleaning out the aviaries, watering and preparing food for the birds plus the numerous other tasks involved. Even children get involved as volunteers which is great to see. You may have heard of ‘planking’, well, Wingspan has ‘Stooping’ on Facebook. This was an initiative that was posted purely to celebrate flight, raptors and falconers. The challenge is out to ‘stoop too!’ so check it out, take a photo and post it. Check out the Wingspan facebook page while you’re at it. 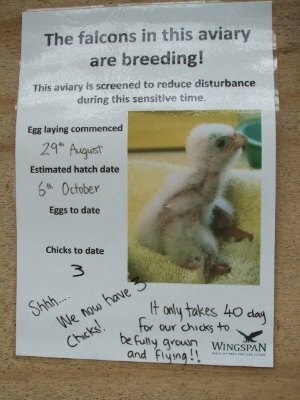 This was set up to help increase exposure about the research and conservation of New Zealand raptors. 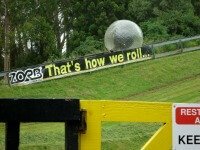 Wingspan, Rotorua is located in a rural setting. Looking at the google map, it shows the way from the i-site in the city. There are no bus services out this way, the closest you could get would be to the Agrodome and from there it would be quite a hike. The facilities at Wingspan are basic with tea/coffee etc available. 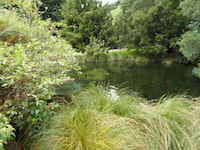 Picnics can be taken and enjoyed in the farmland setting. 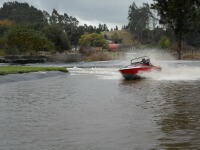 Off-road parking is available at Wingspan which is located in a rural area. The parking is right outside the main building so there would always be someone about to keep a beady eye on vehicles. What time is the flying display? 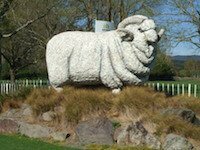 2pm each afternoon and make sure to get there early to snaffle a seat else you're sitting on the grass. The usual, sunscreen, brollies, wet weather gear… just in case. The birds still fly in the rain. They probably need the exercise just like we do. Yes, it would be about a 50m flat walk to get to where the birds fly. This is partially over grass. They get a lot of people out there with walkers and the like. You would be looking at about an hour for the falcon flying display. 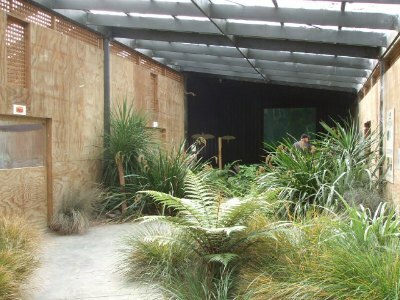 Add on a wander through the little museum and the aviary and it would probably take about 1½ hrs all up. Yes. Children love visiting and learning about our native birds of NZ. They sometimes go on to raise money to donate to Wingspan. Contact Wingspan directly to book and get a discount.